There are always those awkward areas in homes. Places where builders don't help you out and maximize the space and you're left with unused square footage. One of the main offenders in this space battle is the staircase landing. Some staircase landings are exceptionally large and could really be made into useful space. However, many people just don't know how to address them. Today we're giving you a few ideas for ways to use that space. 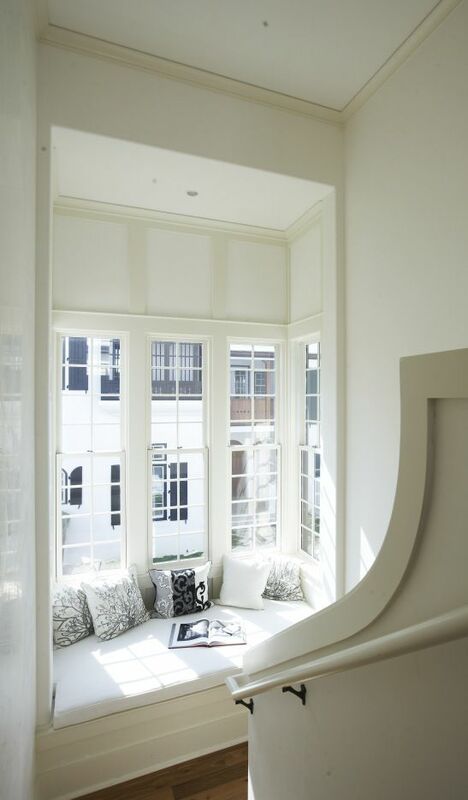 Now a lot of it depends on the size of your landing so use whichever idea best fits your space....but there's a lot to be said for a cozy little window seat/reading nook at the top of the stairs. It seems like this would be the perfect little greeting to anyone coming up the stairs and it's the perfect spot to set those items you need to bring down the stairs at some point but don't want to do right this second so you need a place to leave it until tomorrow morning... :) This little window seat can be accomplished by a built-in bench with a cushion and pillows (never forget the pillows!) or a simple freestanding bench or daybed that fits the space well and serves the same purpose! If you don't have a large space but want to do something with it, consider adding some built-in shelving. Everyone could use some extra storage so if a space is going to be un-used, you might as well add some extra shelves, at the very least! If you do have a little more area to work with, try setting up a desk and making a little workstation on that landing. It doesn't have to be overkill...obviously you won't be spending hours and hours there...but it should look inviting and finished. If you really only have a wall and no floor space to build out into, use the wall! Add a few hooks and shelves and create a mid-way mudroom for the kids. 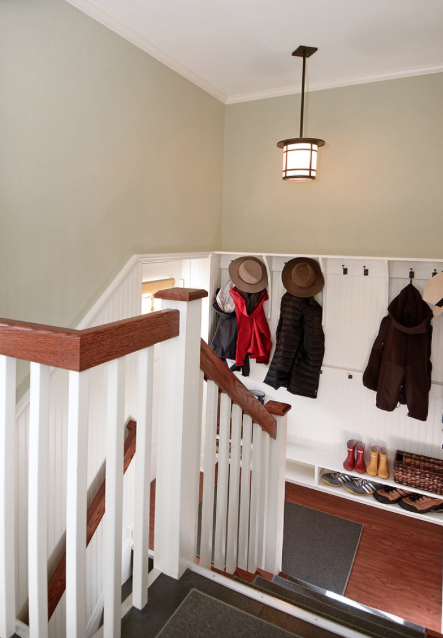 If your home's floor plan has it where the entrance leads straight up the stairs without taking them through the mudroom, leave an area for them on the landing to hang their stuff. Now, we'd be lying if we said you wouldn't have to go behind them and straighten it up, but it's still better than ending up on the floor, right?! Hope that helps! Just a few quick ideas to make the most out of your space!